Value Investing In KLSE: Will M3nergy CEO Datuk Shahrazi able to convince Datuk Yaakob to sell his shares? Will M3nergy CEO Datuk Shahrazi able to convince Datuk Yaakob to sell his shares? I'm sure Datuk Shahrazi spoke to the major shareholder (could be Datuk Yaakob) before he launched the take over offer.Datuk Yaakob is the major shareholder of Melewar which owns M3nergy.There could be some arrangement between them,just like what we saw in Astro privatisation. 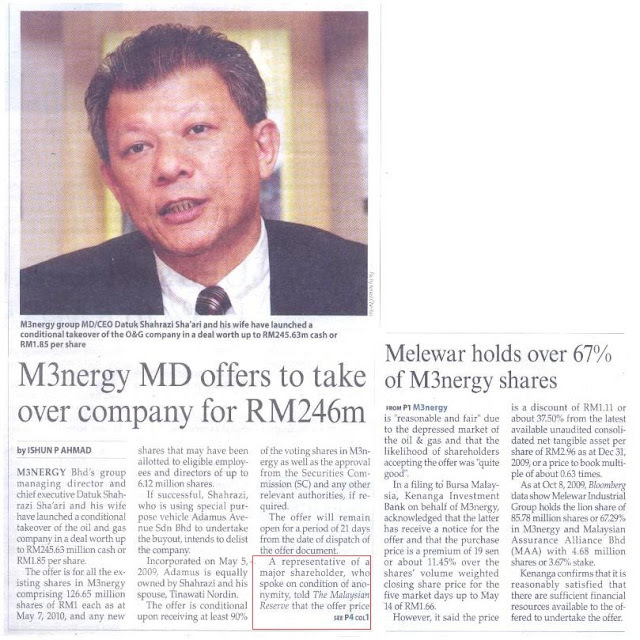 The CEO's willingness to buy up the company @ RM 1.85 per share signifies that M3nergy is deeply undervalued.The CEO knows something great is brewing in M3nergy. Please continue to accumulate M3nergy for long term. The fact remains that the offer price is still rather low versus the NAV of the stock. Given the firm is very much in the red, the last offer rejected was RM 1.20. I suspect many bought in the RM 1.40 - 1.60 range. As long as Datuk Yaakob 'have some arrangement' with Datuk Shahrazi,the takeover could work. I heard that M3nergy are bidding for field operation in India and Indonesia.There are high probability that M3nergy will win the bid by looking at its track record.